I am honored to help to inaugurate The Journal of Humanities in Rehabilitation. The birth of this journal is a watershed event, for it signals a wide and deep connection among those in all the rehabilitative disciplines. It further proposes that the humanities—literary texts, autobiography, visual arts, performance arts, music, philosophical thought—are full partners in the restoration of health. Perhaps we might even come to think that rehabilitative work, including work in the humanities and the arts, are full partners not only in the rehabilitation but in the habilitation, that is to say, the healthy living in one’s habitation, one’s dwelling place, one’s body. Having the occasion to write this essay gives me a means to graphically give thanks to the physical therapists, occupational therapists, and physiatrists who have schooled me in the ways of the body. Some of the most important events in my clinical practice of general internal medicine happen without words. I receive a visit in the clinic from my elderly woman patient doing better than expected in treatment for her advanced small-cell lung cancer. Her chief complaint, as we persist in saying in internal medicine, has nothing to do with her breathlessness or the looming end of her life, the end that we all can see coming. Instead, she says her feet hurt. Her feet hurt. Leaving my stethoscope on my desk, I get on my knees on the floor in front of her chair, I take off her shoes and socks, I start with the foot that hurts less, and I rub it. I don’t know how to do therapeutic massage, but I’ve comforted lots of ailing people. So I gently knead and stroke and circularly caress her soles and toes and ankles. She relaxes. She smiles. Next time she visits me, she says I have magic hands. Patients’ bodies speak to us, and our bodies speak back. This I have come to understand not by virtue of my internal medicine training but by virtue of a life lived among patients and clinicians who respect the body enough to listen to it. With some sense of disloyalty to my own profession, I have to admit that internal medicine has yet to understand this, except along the edges in palliative care or what is now called integrative medicine. And so, many of us in conventional medicine seek wisdom from those healers who have the skill and insight to enter, with presence, into the presence of the ill person. I was visited by a metaphor at the beginning of what I came to call Narrative Medicine, the form of clinical practice fortified with the narrative capacity to receive the accounts patients give of themselves. It is the metaphor of the clearing. Our work in Narrative Medicine, it seemed to me, opens up a clearing that invites clinicians, patients, patients’ families, writers, teachers, corporate leaders, and all who have a stake in health to gather, in safety, to work toward their common goals. I know that the image came to me as I read Toni Morrison’s magisterial novel Beloved. Near the beginning of this novel set in the American South several years after the Civil War, the scene of the clearing in the forest occurs. Baby Suggs is the matriarch and minister of a community of freed slaves living near the sites of their former lives. On Sundays, she gathers around her neighbors and friends, neighbors and friends who have been enslaved, who have been tortured, who have been treated as if they are not human by the white Southerners. Once these patients and others like them are out of danger of death, they find themselves in stroke units or rehabilitation hospitals where the work of regeneration and recovery unfolds. These sites of care are clearings too, forming a protective space for the newly transformed self of the patient to face what has happened to him or her, to expose the shocking new frailties and losses, and to then get to work with those professionals in the clearing who respect the body enough to really work with it. The singular work of restoration is accomplished by rehabilitative specialists who teach patients again to speak, to swallow, to balance, to turn, to sit, to wait, and to work for health to accrue. The clearing in this case is the clearing of all who need such restoration and all who enable such restoration to occur. Like Baby Suggs proposes, to love the body means to use it. She entreats her forest-church parishioners to sway, to pirouette, to sing, to raise high the arms, to open wide the mouth, to bellow. In like manner, I see rehabilitative specialists in the physical therapy gym not just examining the body and then talking about it (like my colleagues and I do in medicine). Instead, they move the parts. They summon the parts to move. Gradually, their expert summoning can be answered by sluggish muscles whose neural circuits have been temporarily blocked by a stroke. The therapists summon into wakefulness a patient’s proprioceptive endings, so mysterious, that, as they awaken from neurological assault, softly return to the patient a sly sense of where in space they are. In a work of choreography more complex than American Ballet Theater’s Swan Lake or Radio City Music Hall Rockette’s Christmas show, the speech pathologist helps a patient to synchronize the skeletal and smooth muscles of the lips, the tongue, the cheeks, the oropharynx, the glottis, the epiglottis, and the esophagus to swallow a bolus of food. What a vast future unfolds in rehabilitative sciences and practices. We know by now that illness cannot always be expressed in words.8 Those who would care for the sick, therefore, have to become fluent in means other than language by which their patients might tell of what they are going through. With the engagement of the humanities in their work, the rehabilitative specialists become the expert witnesses who can behold and then articulate the drama of self enacted in treatment, no matter how this drama comes into view. Reciprocally, the work of healing occurs in far more registers than we might imagine. With the engagement of the humanities in our work, we might adopt more treatment modalities than are currently used. When Mark Morris Dance Company’s principal dancer David Leventhal discovered that dance can improve the health status of patients with Parkinson’s Disease, he established his own company called Dance for Parkinson’s, in which he teaches patients with movement disorders how to dance. As they do so, their movements become more fluid, more intentional, more meaningful, and even more beautiful.9 This is but one example of the new healing plots that will become available to patients and providers in the rehabilitative fields as they school themselves in the creative ways of the body to discover, express, and then to share their own plots of health. We take our great hearts to the Clearing. We take to heart Baby Sugg’s lesson that enslavement—by plantation owners or by disease—targets the body, and by so doing challenges the self. We counter the solitary confinement of slavery or stroke, opening up by our own presence the isolation that punishes the patient, freeing that patient to grow. We join with one another and with our patients, not only for the giving and recording of complaints. We gather to witness the life being performed for view, right now, in this speech-and-swallow treatment session or this training session in using a bridge to transfer from bed to chair. Not just patients’ lives but ours too, we clinicians, we erstwhile healthy professionals, who, as dwellers in a human body, are ourselves mortal, destined toward frailty and death. In the precincts of rehabilitation, it is not just possible but necessary to claim one’s body, to accept one’s temporary space on earth, and to join with those who suffer so that all of us suffer less. This is the hope and the promise. 1. Morrison T. Beloved. New York, NY: Penguin/Plume; 1988. 2. Merleau-Ponty M. The Visible and the Invisible. Translated by Alphonso Lingis. Evanston, IL: Northwestern University Press; 1968. 3. Noland C. Agency and Embodiment. Cambridge, MA: Harvard University Press; 2009. 4. Prager J. In search for the man who broke my neck. TED Web site. https://www.ted.com/talks/joshua_prager_in_search_for_the_man_who_broke_my_neck?language=en. Accessed November 22, 2014. 5. Ackerman D. One Hundred Names for Love: A Stroke, a Marriage, and the Language of Healing. New York, NY: WW Norton; 2011. 6. Price R. A Whole New Life: An Illness and Healing. New York, NY: Atheneum; 1994. 7. Mattingly C. Healing Dramas and Clinical Plots: The Narrative Structure of Experience. New York, NY: Cambridge University Press; 1998. 8. Conway K. Beyond Words: Illness and the Limits of Expression. Albuquerque, NM: University of New Mexico Press; 2013. 9. Dance for PD Organization. Dance for PD Web site. http://danceforparkinsons.org . Accessed November 23, 2014. 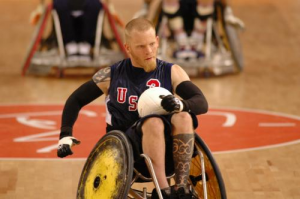 Released in 2005, the documentary film Murderball ignited the nation’s interest in quad rugby, a high-octane version of wheelchair rugby. More importantly, the film has shed some much-needed light on the daily lives of those who have sustained spinal cord injuries. More than a great sports story, Murderball demands a certain level of respect that is inherent to watching any disabled person achieving something previously thought to be out of reach, like winning a gold medal. The progression of events presented in the film reminds viewers that life goes on after an accident or disease interrupts the brain’s connection with the arms and legs. Murderball opens with paralympian Mark Zupan getting dressed for a workout. Zupan is presented at first as being just a guy going out for a jog around the block—in his wheelchair. The film follows Zupan and the United States quad rugby team as they train, compete, and unwind in the same way any able-bodied team would. They develop a fiercely natural rivalry with the Canadian team when Joe Soares, who was previously cut from the American team, becomes the head coach of the Canadian national team. Soares and Zupan have a mutual disdain for each other on and off the rugby court, which stirs a sincere sense of patriotism. Nonetheless, the film doesn’t ask you to choose sides. Instead, it asks that you consider each player individually as a piece of the quad rugby puzzle. As viewers, we witness a change over the five years depicted in the film in the players, the venues, and the game itself. 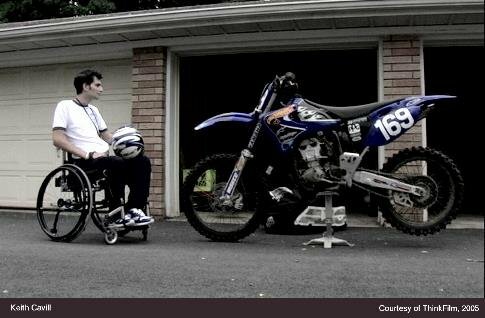 The most striking evolution takes place, however, in the secondary story of Keith Cavill, who sustained a spinal cord injury while racing motocross. He is representative of the majority of quad rugby players in that previous to his injury he had been independent and active. His role is crucial to the story presented in the film because his journey is applicable to those who have gone before, and those are yet to come. The increasing popularity of quad rugby has provided an outlet for many young men and women who have sustained spinal cord injuries. Some even say the game has saved their lives. Once an individual comes to terms with the fact that he (or she) will remain in a wheelchair, they have to make a choice about how they are going to rejoin the world. Zupan describes this process as a card game in which you play or you fold. Sink or float. For most of the young men on the court, quad rugby is the ultimate life preserver. One of the principal therapists presented in the film is Nancy Lehrer. Lehrer started her physical therapy career at Grady Memorial Hospital in downtown Atlanta, Georgia, where she has worked for over nineteen years (oral communication, September 8, 2014). She recalls how she benefitted from the teaching environment at her workplace, the significant autonomy she enjoyed as a clinician, and the experience she gained working with individuals from all walks of life. She spent approximately ten years volunteering with disabled athletes in and around the Atlanta area during the 1990s and early 2000s, including the time when Murderball was filmed. Lehrer describes how her experience with quad rugby began: one day, she was sitting next to a physical therapist who worked at the Shepherd Center (a spinal cord injury rehabilitation center in Atlanta) and who also volunteered with the wheelchair track team. The two therapists began to talk about quad sports and their shared passion for this patient population. Eventually, she began volunteering with the track team training and helping with competition events. At a classification workshop designed to designate players to certain ranking based on the level of spinal injury, she found herself assigned, not to the track or road racing athletes, but to the quad rugby athletes. These experiences seamlessly rerouted her to rugby practices, tournaments, and the World Wheelchair Games in 1999 with the U.S. National Rugby Team. She then traveled to the 2000 Paralympic games in Sydney, Australia. At that event, the U.S. defeated Australia to win the gold medal, much to the dismay of the Canadians, who captured the bronze. During this time Lehrer found that friends had become family, and she found as well that she was meeting people and seeing places she would not have encountered under other circumstances. Thus it was that she applied to travel with the team to the 2004 Paralympics in Athens, Greece. Her close interaction with the athletes and understanding the level of competition they can achieve has ultimately made her a better acute care therapist. She recognizes that there is no “crystal ball” to reveal a how and when along the road to recovery a patient may be able to achieve that type of rehabilitative success. “However,” she says of the hypothetical acute spinal cord injury patients, “when people are ready, we can share what life can still hold for them.” Her acknowledgement of a patient’s personal journey has allowed her to be more present as a therapist and has taught her that consistency is the key. Even if they are so down and frustrated with their condition that they are swearing you out of their room and have no desire to participate in therapy, you still have to show up the next day, let go of any ego, and encourage them to try again. As the team travelled internationally, Lehrer continued to note cultural differences in the way the Paralympic athletes were treated. In the United States, people have a general naivety about those in wheelchairs; there is a learned “Us and Them” mentality that acts as a barrier to understanding them. Fortunately, she found this not necessarily the case with other nations. 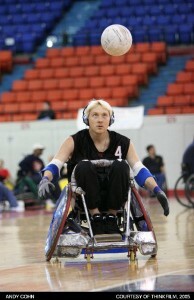 Lehrer described a time when the team travelled to southern New Zealand following the World Wheelchair games in 1999. The team received a warm welcome and signed autographs; it didn’t matter that they were in wheelchairs, it mattered that they had won gold. The game isn’t about making it to the Paralympics or being on a professional team. It is about recruiting players and creating a shared experience that fosters a sense of belonging. “On the court it is competition and win, win, win,” says Lehrer, “but off the court we are friends and family.” The sport is about commitment, social support, bonding, and being the best they can be, just like any able-bodied sport. The film intentionally highlights that element of the story without neglecting where the players have come from and how they have moved beyond what is widely considered possible. Dr. Tami Phillips and Dr. Laura Zajac-Cox are co-directors of Emory University’s DPT Adult Neurological Rehabilitation Complex. They agree that Murderball can be a valuable learning tool in the spinal cord injury (SCI) curriculum (oral communication, September 22, 2014). In previous years, the film was shown as an educationally inspirational piece before the DPT students embarked on their two-week neurological clinical rotations. Dr. Zajac-Cox is struck by the players’ aggressiveness and agility on the court, but more so by the film’s ability to highlight the players’ potential without the interference of any artificial limits. She feels the film raises the bar of understanding and highlights many moments that are difficult to include in a classroom setting. “They are normal guys socializing; they have normal cares and concerns,” says Dr. Phillips. 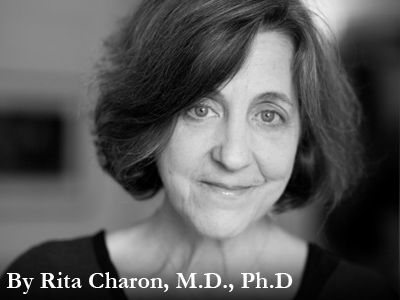 Both professors feel that the medical and rehabilitation communities frequently fail to address the considerable ambiguity surrounding sensitive subjects like sexual function and driving capability that many neurological patients face once discharged. 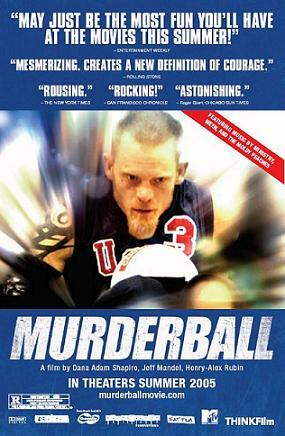 Murderball effectively and honestly presents both issues in a way that cannot be taught from a textbook or classroom discussion. While Murderball was not meant to be an educational film per se, short video clips of interviews done with the players or of the game itself, would be advantageous supplements to classroom discussion. The frank honesty of the film has the potential to engage a class of students on a more intimate level as they learn about the personal experience of disability. Alternatively, the entire film could be incorporated into a neurorehabilitation syllabus as an outside assignment with subsequent classroom discussion and analysis. Regardless of the method, Murderball should be considered a multi-use tool in the educational tool box. Murderball’s director, Dana Shapiro, shared his reflections on the ten years that have passed since the movie’s premiere (oral communication, December 4, 2015). Dana Adam Shapiro was nominated for the 2006 Academy Award for his first film, Murderball. His second film, Monogamy, was nominated for a 2011 Independent Spirit Award. Shapiro is a former senior editor at Spin, and a contributor to The New York Times Magazine and other publications. His most recent book, You Can Be Right (Or: You Can Be Married) was published by Scribner in 2012. Shapiro produced and co-directed Murderball with his colleagues Henry-Alex Rubin (co-director and cinematographer) and Jeffrey V. Mandel producer). The Sundance Film Festival Audience Award for Best Documentary, the Full Frame Documentary Film Festival Audience Award for Best Feature Film, the Indianapolis International Film Festival Audience Award for Best Feature and Best Non-Fiction Film, and a nomination for Best Documentary feature at the 78th Academy Awards.